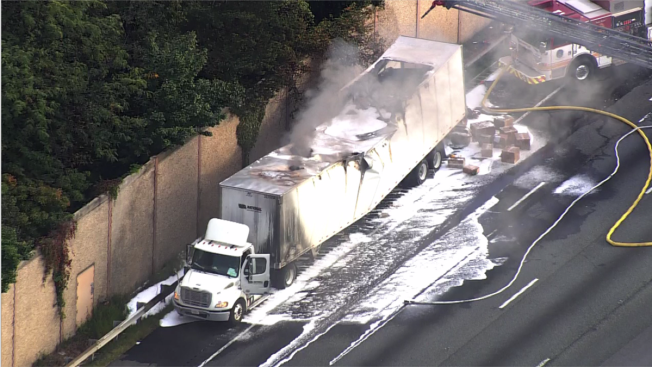 A tractor-trailer fire on I-95 South near Baltimore–Washington International Airport in Maryland completely closed all southbound lanes early Friday. Drivers still faced major delays and were getting by only on the left shoulder as of mid-morning, the Maryland State Highway Administration said in an update. The truck caught fire on I-95 South prior to Route 100. The blaze caused significant damage to the tractor-trailer. Chopper4 footage shows thick smoke around the vehicle. At least five fire trucks responded. Information was not available immediately on how the fire started or if anyone was hurt.